Kick off the evening with Cuban food and drinks, and then join See Chicago Dance and the Auditorium Theatre for an evening with choreographers Osnel Delgado, Artistic Director of Cuba's Malpaso Dance Company, and Robyn Mineko Williams, former member of and regular contributor to Chicago's own Hubbard Street Dance, as they explore and discuss how they use dancers' bodies to interpret and translate universal ideas when creating a work. How do choreographers convey meaning and evoke specific emotions through dance to audiences that speak different languages? How can dancers and creators who speak different languages overcome language barriers to create a piece that transcends the spoken word?Hear and see some of the most innovative artists in contemporary dance approach this illuminating topic, and then stay to learn some Cuban salsa with Denita Inez of Desueño at the end of the evening. The conversation will be moderated by Jorge Perez, Executive and Associate Artistic Director, Ensemble Español Spanish Dance Theater. 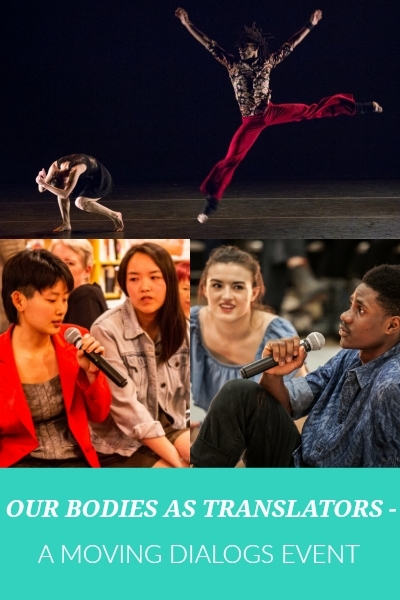 The Auditorium Theatre’s commission of a new work for Malpaso Dance Company is made possible through the generosity of Pamela Crutchfield (Lead Commissioner) with additional support from Patti Eylar & Charlie Gardner and Amalia & William Mahoney. Additional support for this project is provided by the John D. and Catherine T. MacArthur Foundation through the International Connections Fund. Support for Moving Dialogs is provided by Elizabeth Liebman.